Summer is a popular time to take the family on a vacation. Minnesota is the perfect state to invest in a vacation property, given our wide range of opportunity for lakefront housing. Many choose to leave the state (or even the country) each summer for a relaxing getaway. Take your loved ones on a road trip around the country or destination of your choice. If you’re more of a homebody, there are still plenty of great Minnesota-based vacation options. The land of 10,000 lakes means 10,000 reasons to invest in a watercraft vehicle. Even if you are just using it on the lake over the weekend, investing in a boat will give you many more opportunities for summer adventures. Already have a boat? Make this summer the year to upgrade to something a little more powerful or something with a bit more space, then you can stop staring enviously at your neighbor with the new 30-foot pontoon. Add some high-quality tubing accessories onto your bucket list, and invite a few friends for a day of summer fun that will be the envy of everyone else on the lake. Every homeowner has plans to build a gazebo, make landscaping changes, or make energy efficient changes to the house. The list of ideas goes on and on! Somehow, thoughts of these plans almost always end with one word: someday. Summer is the perfect time to make these changes in your home. You can also make a few necessary investments during the summer that can save you money in the winter. Need to fill up your LP tank this winter? Many times, you can get reduced prices in the summertime. Thinking of switching your heating to a wood-burning stove? Make plans now- why wait until the cold hits? Clark Griswold wanted to use his christmas bonus to build his family a pool, and we all know how well that turned out for him. Pools (especially in-ground) can be an extravagant expense to some, but the equity it adds to your home can end up paying for a big chunk. Let’s be honest, you’re lucky if those inflatable options you purchase at big box stores last longer than one summer. Give yourself a summertime treat that will not only improve your kids’ opinion of you, but also the value of your home! Whatever may be on your summer bucket list, Financial One Credit Union can help. 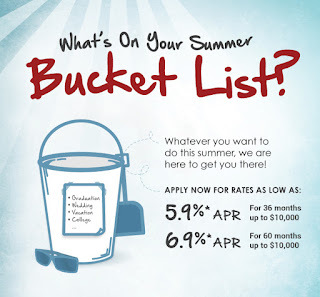 With low rates and easy payment options, completing your summer bucket list is easier than you may think. Check out our flexible loan options to see for yourself!